All of the doctoral students in the structured doctoral model “Integrated Track” are assigned to one of the nine a.r.t.e.s. graduate classes. Each individual project is embedded and discussed in a broader thematic and interdisciplinary framework. The themes of the classes relate to each other historically, systematically and methodically. They also relate to the research areas and areas of excellence of the Faculty of Arts and Humanities. This helps to create a productive environment at the levels of individual disciplines, the graduate classes and the entire graduate school – be the problem broadly or narrowly defined. Each graduate class is headed by two professors of the Faculty of Arts and Humanities. Together, they form the a.r.t.e.s. commission, which supervises the application and selection process for the Integrated Track. In summer semester 2019 Prof. Dr. Susanne Wittekind substitutes Prof. Dr. Sabine von Heusinger. Research in class 1 focuses on the constitution, reception and transformations of cultural and social achievements – in various figurations and manifestations – which structure the culture of the Antiquity and the Middle Ages and its perception in the longue durée of the history of their reception, using historical, literary and material sources. It explores the development and specification of knowledge, concepts and social relations as manifested in texts and objects as well as the varying roles different media played in these processes. The class focuses on theoretical concepts that are equally import for linguistic and literary studies, but emphasize different methodological perspectives and disciplinary contents. These perspectives and contents will serve as a transdisciplinary framework for developing and discussing different empirical, historical, and hermeneutical dimensions. Thus, the class combines structuralist, cognitive, constructivist, pragmatic, intercultural, epistemological, and aesthetic approaches to unfold the interrelation between the concepts “language”, “discourse”, and “culture”. Following the various modes of this interrelation will enable us to analyze the conditions of discourse production and reception as well as to pursue concepts, metaphors, and genres such as “Irony” or “Horror” as discursive phenomena. Under the umbrella approach of Media Studies, class 3 combines the areas of medial cultural studies, literary studies, Bildwissenschaft and Musicology. The objects of these closely related fields are examined with an inter- and transdisciplinary approach and with a specific focus on their mediality. The class brings together the interests of many disciplines and its thematic range seems very broad, yet the focus on each object’s mediality serves as a common denominator at all times. Another systematic and topical interest pursued in this context is related to the description of digital and analogue media with a focus not merely on the contemporary tendencies of miniaturisation and mobilisation, but also on historical and theoretical questions. Research in class 4 is concerned with the historicity of artifacts, substances, and other kinds of matter as well as with the materiality of history in the early and late modern world. It brings together graduate students interested in cultural histories of the material world – as in, the social construction of things – but also in debates about the physical, sensory and functional possibilities and ‘capacities’ of materials and their constitutive power to act upon and define human culture. Students in the class will work on a broad spectrum of topics, ranging from food history to Science and Technology Studies or media history. Research in class 5 looks at the change in relationship between inequality and governance throughout history from Antiquity up to the 21st century. Europe’s various regions and the regions of former European colonies are at the forefront of interest. Although the interrelations between inequality and political rule have always been part of the constitutive and existentially determining characteristics in all historical societies, their institutional structures, practices and forms of legitimation have been subject to profound changes. What is of particular interest are processes of transition, erosion and renewed stabilisation, de- and re-legitimation of socio-political orders and structures. Research in class 6 is dedicated to the interface of cultural questions and questions from the life sciences, especially those problems concerning the relation between nature and culture. Among these are questions concerning the privilege of interpretation in the life sciences or problems of the mindbody relation, e.g. in the debate on the extended mind. Another focus of this class is also dealing with the analysis of culturally specific and historically fluctuating ideas of morality and ethics while looking at how these locally specific normative organisations change and reconfigure under the impact of an intensified globalisation of the connections between local institutions, protagonists and concepts. Class 7 develops comparative perspectives from the Global South with regard to questions of social relations, cultural exchanges, group identities and the ecological implications of socio-cultural networks and mobilities. Global issues such as migration, labour relations, the flow of commodities and changes in the repertoires of communication are central for understanding dynamics of integration and exclusion across scales. They are also key fields for reconceptualizing social theory and for critically assessing Eurocentric biases in our disciplines. By including all regions of the world and a diversity of disciplines we seek to foster a methodologically diversified approach towards a better understanding of the global flows of material goods, ideas and people. Class 7 is associated with the Global South Studies Center and is held in English. Research in class 8 is concerned with linguistic prominence, a central organisational principle in linguistics and cognitive sciences that guides language production and perception. The notion of prominence is investigated in different areas of linguistics: prosody, the interface of morphosyntax and semantics, and in discourse pragmatics. The class seeks to advance the theoretical characterisation of prominence as well as to assess prominence through empirical investigation. Of further interest is also a comparison of prominence with other structure building principles in language, cognition and culture. Class 8 is associated with the Collaborative Research Center 1252 “Prominence in Language”. Class 9 uses the key concept of conventionality to engage in a reorientation of interdisciplinary research regarding the Middle Ages. Conventionality signifies all rule-based forms of common actions and practical knowledge that are based on social agreement and guarantee cultural and societal stability and are yet intrinsically apt to various forms of modification and adaptation. Thus, conventions are crucial to facilitate processes of transformation whose effects transcend the great narratives of progressive modernization. Using ‘conventionality’ as our key concept, we aim at reconstructing the dynamics of European societies and cultures for the time period between 400 and 1550. 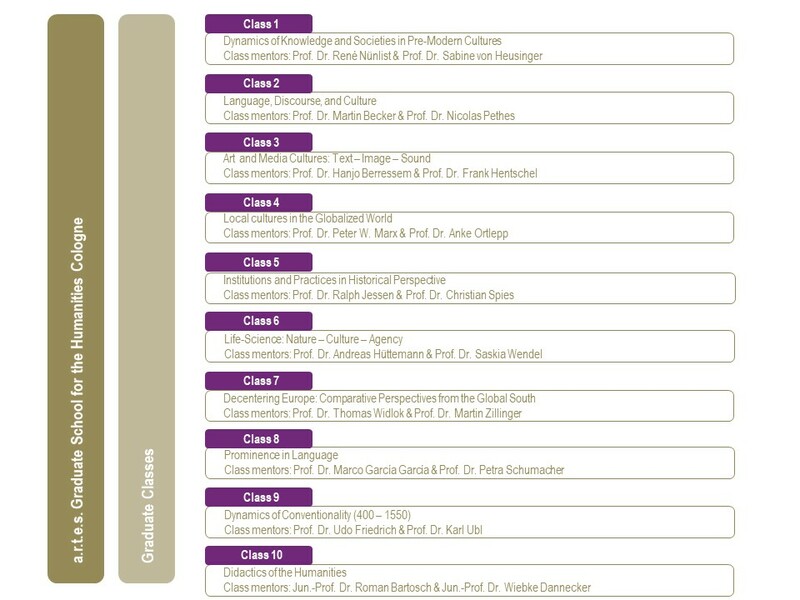 Class 9 is associated with the Research Training Group 2212 “Dynamics of Conventionality” at the Zentrum für Mittelalterstudien. Umstrukturierung der a.r.t.e.s.-Graduiertenklassen für Literatur und Linguistik Welche Veränderungen hat es aus der Perspektive unserer Mentorinnen und Mentoren gegeben?